Climate change brought down a Russian airliner last week and massacred at least 150 people in Paris today, Friday, November 13. According to the Commander in Chief, as of yesterday, ISIS is contained, and Islamic extremism still doesn’t exist. Earlier today, he needs to not jump to conclusions on *this shooting. So, our first priority, everyday, for our safety, is to battle the greatest threat to our daily lives–climate change. Civilization will end as we know it because we didn’t “do our part.” Be vigilant by being Green. Sleep well tonight, for unlike are fellow Parisians, you survived another day. Just don’t forget to recycle, shower for only 2 minutes, and measure your carbon footprint. Now, to the innocent and wise, and to all the Christians who have not been crucified, burned alive, beheaded, tortured, shot and buried in a mass graves over these past few years by Isis and other Islamists, please pray. Pray for Paris. Pray for the civilized. Pray for a leader who can and will recognize evil and destroy it. 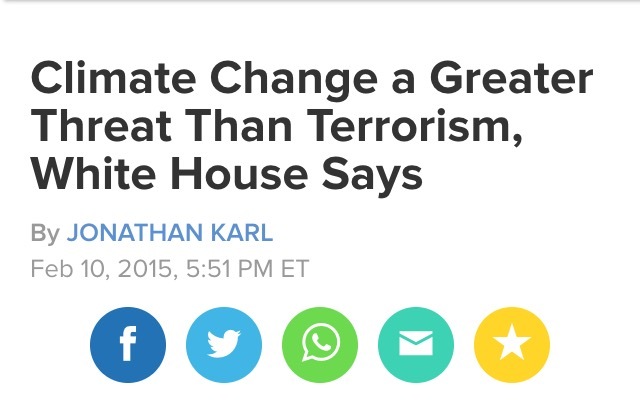 (Less people should make the climate change “scientists” happy. It’s a win win). I, of course, will pray for this too…as I prayed for Fort Hood, Chatanooga, Boston, NYC, DC, Virginia, Pennsylvania, Oklahoma, Garland TX…and other “random” extremist incidents and locations. May God ultimately show us mercy and may good triumph over evil. And to my friends in Paris…Mon coeur est brise. Je suis desole. ? ?